Supporters of Sen. Antonio Trillanes IV are now gathering in front of the Senate building today in an effort to thwart any attempt to arrest him without a proper warrant. Also within the day, Trillanes is expected to ask the Supreme Court to issue a temporary restraining order against President Duterte’s order for his arrest. We do not intend to discuss the technicalities of the President’s arrest order against his nemesis Trillanes. Traditional and online media are already doing this. We’d rather bring your attention to the President’s agenda and the looming consequences should Trillanes be arrested despite the amnesty given him by the Aquino administration for the crimes of mutiny and coup d’ etat. Clearly, this is a blatant case of political persecution. Observers point to two major things that Trillanes, an outgoing senator with barely a year left in his second and last term, did to earn the President’s ire. First, he dared then presidential candidate Duterte to sign a waiver that would allow anti-money laundering investigators to examine his supposed multi-billion peso deposits in a branch of the Bank of the Philippine Islands. Trillanes insists that since 2016, Mr. Duterte has branded himself as a simple and down-to-earth local mayor but has cash that can be considered unexplained wealth. Second, Trillanes also insinuated that the President’s son, Vice Mayor Paolo Duterte of Davao City, is a major player in the illegal drugs distribution in the country. In a Senate hearing on the disappearance of P6.4 billion worth of shabu from the Bureau of customs, Trillanes dared Paolo, invited as a resource person, to take off his shirt. The senator claimed the vice mayor has a huge dragon tattoo on his back, indicating his high rank in the Chinese Triad. The vice mayor adamantly refused to oblige. There is however, a third character to this arrest order saga apart from president and senator—Solicitor General Jose Calida. 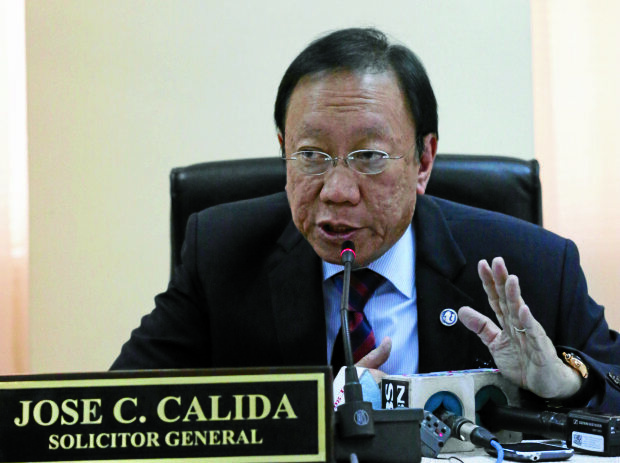 Trillanes, chair of the Senate civil service committee, recently raised Calida’s hackles when he called for an investigation on the Vigilant Investigative and Security Agency, Inc., where the Solicitor General allegedly enjoys majority ownership. Trillanes cited conflict of interest in calling for the probe. Trillanes alleged Calida secured multi-million contracts with various government offices for his company. Tuesday when Trillanes was to start the Senate probe on Calida was also the morning when President Duterte’s arrest order was announced. 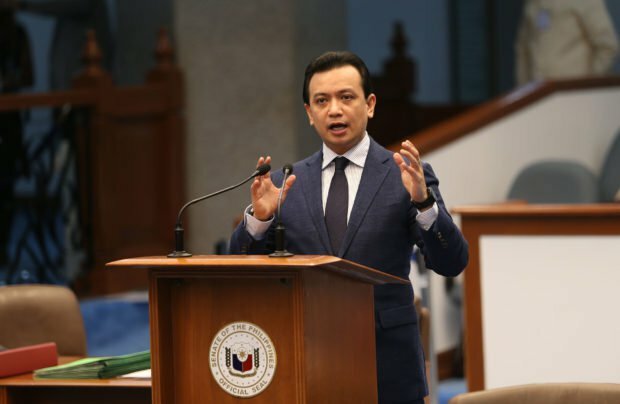 While being tried at the Makati Regional Trial Court (RTC) in November 2007, Trillanes broke off from his security aides, walked to the Manila Peninsula and announced another military break from the Arroyo administration. Months after he became President, Benigno Aquino III offered amnesty to soldiers, policemen and civilians who participated in the attempts to bring down the Arroyo administration. Trillanes was in the first group that applied for amnesty and was also among the first to be granted it because no one, not even his prosecutors, opposed his application then. Aquino signed Proclamation No. 75 in November 2010 making amnesty to the mutinous soldiers official. The House of Representatives and the Senate concurred this. On December 20, 2010, Trillanes was released. Trillanes’ move to investigate Calida however, apparently spurred the Solicitor General to ask about his application for amnesty with the Armed Forces of the Philippines (AFP). Calida’s inquiry was confirmed by AFP spokesperson Col. Edgard Arevalo. On Tuesday, President Duterte announced he is revoking the amnesty Aquino gave to Trillanes, insisting that the senator failed to apply for amnesty. Various media entities later aired a low-resolution video of Trillanes swearing before authorities when he submitted his application. Mr. Duterte issued Proclamation 572 nullifying Aquino’s Proclamation No. 75. The current president said Trillanes cannot avail of amnesty because he never admitted his guilt. Justice Secretary Menardo Guevara announced later that Trillanes would regain his military rank and will be subject to court martial proceedings for his omissions. 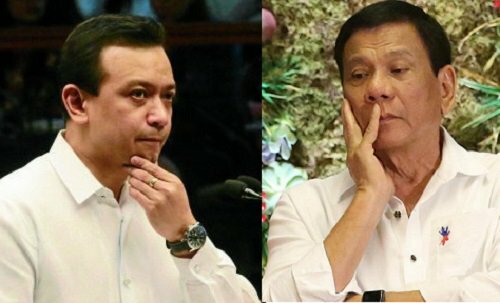 Trillanes has vowed to question President Duterte’s acts before the Supreme Court. The senator has so far spent several nights holed up in his Senate office, where he enjoys a semblance of protective custody, as government men scramble to produce an authentic warrant for his arrest. Meanwhile, officials of the previous administration insist Trillanes’ amnesty passed through the proper channels. First, we now have a president who believes he can nullify previous proclamations issued by his predecessors. This is unprecedented and based on accounts by legal experts, illegal. Done solely to harass and put away a political opponent, this is a chilling sign. We also now have a president willing to mobilize the resources of the state to bring down a political opponent. Calida’s inquiry about Trillanes’ amnesty application papers and the supposed disappearance of the same not only raises eyebrows. It can also be interpreted to mean the administration is wiling to destroy/hide official documents should they be inconvenient to one’s sinister plans. That there are government and military officials complicit to a president’s demolition agenda should also send shivers down our collective spine. Before Trillanes, opposition senator Leila de Lima was accused of being a drug lord and is now detained in Camp Crame. Supporters however, point to De Lima’s decision as chair of the Commission on Human Rights to investigate the so-called Davao Death Squad linked to then Mayor Duterte as the real reason for her incarceration. What makes the whole situation worse is we have lawyers who vowed to uphold the law among executive officials and members of Congress who remain silent over President Duterte’s latest episode of abuse. It seems we cannot expect better from the judiciary, particularly the Supreme Court where Trillanes intends to submit his petition for a temporary restraining order to prevent authorities from arresting him. Remember that it has only been days since Chief Justice Teresita de Castro, a major player in the Duterte-instructed ouster of predecessor Maria Lourdes Sereno, has been appointed with a term of 44 days. Mr. Duterte has so far targeted two opposition senators. High ranking officials duly elected by the people. What would stop him from targeting those with less power or no power? If human rights advocates are correct in accusing the President of being behind extra-judicial killings of drug addicts from the lowest rungs of society and heck, even innocent students, this means there is no chosen demographic. Everybody is fair game. We have a chief executive who, by numerous indications, clearly has Congress and the judiciary under his control. Until now, our elders are haunted by the memory of martial law and the abuses committed by President Marcos. And our current leader is noticeably lifting moves from the dictator’s playbook. Let all of that sink in. Header image courtesy of Lyn Rillon/Inquirer.